Careers Cost > How Much Do Copies Cost? Since owning a commercial grade copying machine can be relatively expensive, there may come a time when you have to make some copies at a local business supply store such as Kinkos, Staples, or Office Depot. Of course, these copies won’t be free and will, unfortunately, come at a cost. The cost of copies will depend on where you get your copies, how many copies you need at once and if it’s black and white or colored. Color copies will always cost more than black and white. Color copies can cost $0.29 to $0.60 on average, while black and white copies can be as cheap as $0.02 to $0.10 per page. Basic black and white copies are ideal for high-volume printing and for those who are looking for simple copies, while color copies are ideal for business presentations, color charts, full-color documents and work that requires a high level of accuracy. 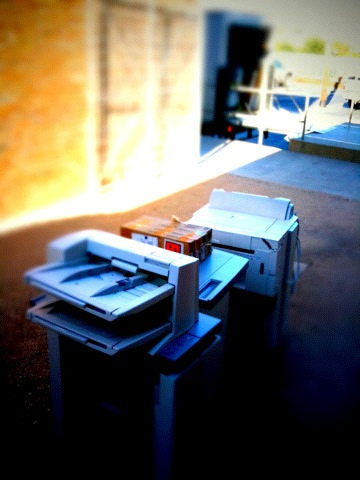 Staples’ Copy and Print Center, for instance, offers a few selections. Basic black and white copies cost $0.10, while the enhanced copies in black and white can cost $0.12. A low-grade (value) color can cost $0.25, while its best package, denoted as the “color pack”, can cost $0.49 per page. eHow.com claims that you should budget anywhere from $0.49 to $0.79, while double-sided color copies will be around $1 to $1.50. DocuCopies.com, a larger copying service online has a calculator where you can enter your information to get a quote. For example, 1,000 basic black and white copies would cost around $0.04 per copy. Depending on the store, some allow you to fax or email in your documents ahead of time, and upon arrival, you can simply pick up your copies. Some stores will have employees who will take your original and make the copies for you, while others may have copy machines that are available for use, but you must do the copying yourself. Most print shops/retailers will offer a wide selection of paper you can choose from. This can include basic (economy) paper to a heavy high-gloss or photo paper. Aside from the basic copying, companies can also bind, hole punch, cut, fold, laminate and staple. Colors and enhanced copies will usually cost the most, compared to black and white jobs. Most centers will use their economy grade paper by default. If you want a premium paper, the costs can be a bit more per page. On average, plan on spending 20% more. Some opt to laminate their copies after they have been done. Again, this can be considered an additional expense. Laminating starts around $0.20 per page. Double-sided copies can increase the price per page by more than 40%. Some services offer premium features such as stapling, folding, drilling for binders, perforating, padding and some will even insert your copies into envelopes. If you need a large poster-sized printout such as a chart or sign, the price will be more for the large size paper. There are some retailers where you can upload your documents ahead of time. They can then print the pages, organize them how you would like, and either mail them to you, or if locally, you can pick them up. If you would like to use a service like this, you will most likely have to pay a setup fee for opening your account in some circumstances. Some print shops, especially if you make the purchase online, may have a minimum order. Make sure you ask about this before starting. If you only need to make a copy here and there, consider buying an all-in-one printer. While you do not want to make multiple copies a day with these copies, they can be used to print a few copies of the same document. Basic printers can be picked up for less than $100. For example, the Epson Workforce 545 retails for $90. The more copies you make, the more you can save per page. Try your best to get all of your copies done at once. If you can wait for the copies, consider having them done online. All you need to do is send in a PDF or the file and they will do the rest. Once completed, you can either have it mailed to you or you can pick it up in store. If you are going to be using copying services quite often, it may be better in the long run for you to buy or even rent your own copy machine. When using a popular retailer, such as Staples, look for coupons online as there are often coupons floating around that could save you money. Check with your local university if you’re a college student or library if you need to make a few copies at a time.